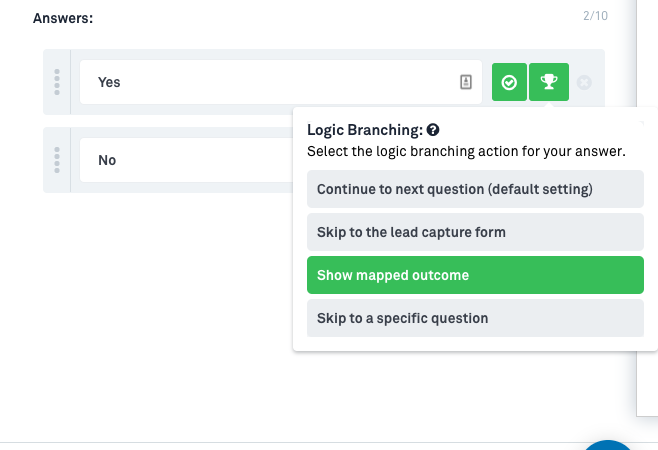 The logic branching feature will allow you to further customize the quiz experience and results that your quiz takers receive. 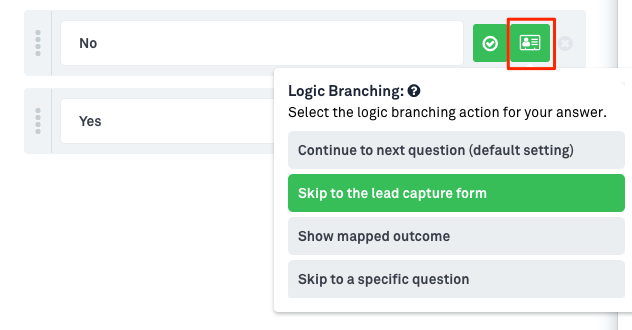 You can send them to the lead capture form if they answer a question a certain way, send them to the results and not capture their lead information as well as send them to a different question if they answer a question a certain way. Find out how to do each of these below! How Can I Send A Quiz Taker To the Lead Capture Form If They Answer A Question A Specific Way? 1. 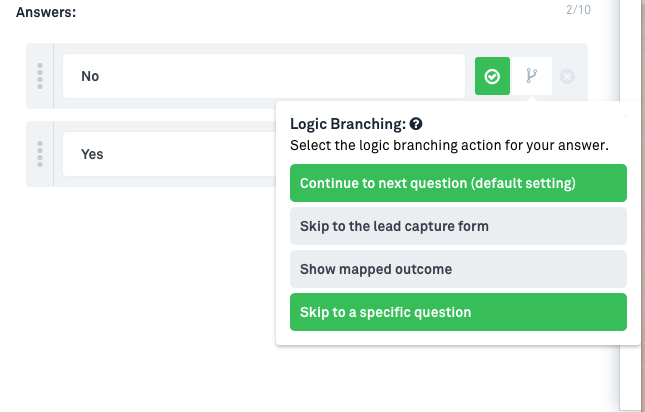 First create your question like normal in the "Questions" section of the quiz builder. 3. You'll know that the outcome is linked to the answer when the box turns green as shown above. 4. Once this is linked click on the branching symbol that you see in the image below and select "Skip to the lead capture form"
5. When this option is selected you will see a "contact card image" where the branching image was, as seen above. And if a quiz taker selects this answer regardless of where they are in the quiz questions they will be taken to the lead capture form. How Can I Send Someone To An Outcome Based On Just One Questions Answer? 4. Once this is linked click on the branching symbol that you see in the image below and select "Show mapped outcome"
5. When this option is selected you will see a "trophy image" where the branching image was, as seen above. 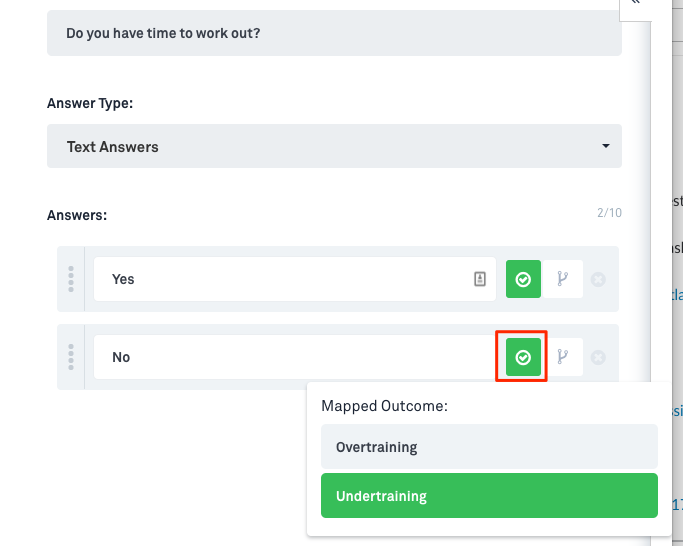 And if a quiz taker selects this answer regardless of the other questions they have answered they will be shown that mapped outcome and not be taken to the lead capture form. How Can I Have A Quiz Taker Skip A Question If They Answer A Particular Way? 4. Once this is linked click on the branching symbol that you see in the image below and select "Skip to a specific question"
5. When this option is selected you will be prompted to select the question that you would like to send people who select that answer to. Once it is selected the number of the question they will be sent to will be shown as you see above.